We love decorating for Christmas, especially when the decorations are made by hand. Whether they’re crafts we’ve made over the years, family heirlooms, or vintage finds from the flea market, our favorites are always homemade! So we put on our matching pea coats and set out to deck our halls with Christmas crafts from the flea market. Neither of us had a list, but we knew we wanted ornaments for the tree and something special to feature by the fireplace. Our first stop was at a booth that looked like Grandma’s house at the holidays. 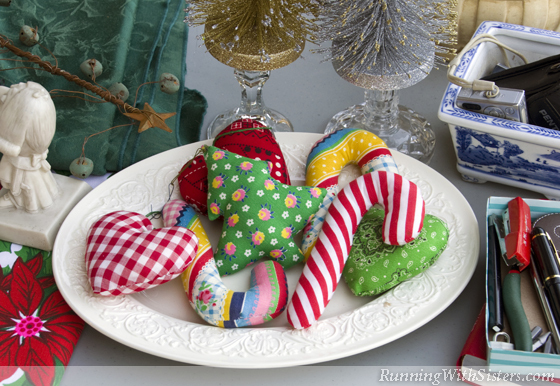 There was a tinsel tree decorated with hand-stitched hankie angels and a table stacked with Christmas china. Jennifer chatted with the vendor about a delightful egg diorama that had a little Santa and reindeer inside on a bed of mica snow. We bought it to share, and we’ll pass it back and forth each year. We spent a lot of time in a stall that was packed with printed Christmas linens and dime-store decorations from the 40s and 50s. Kitty sorted through a pile of felt ornaments, setting a few aside. 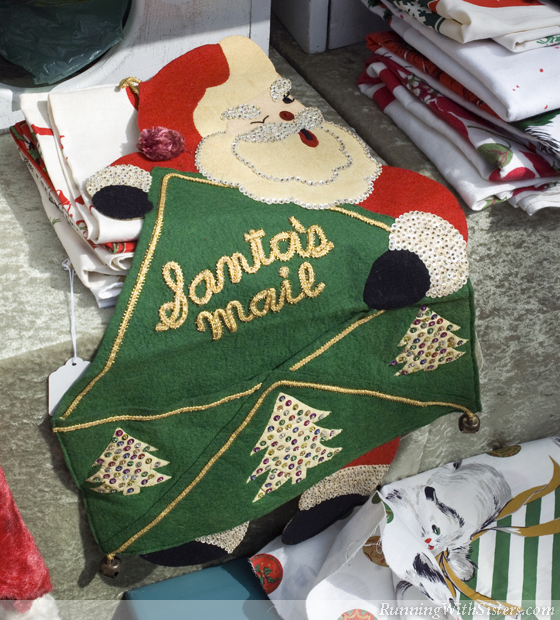 Jennifer checked out a Santa cardholder with “Santa’s Mail” spelled out in gold trim. We told the seller we had the same one when we were kids and that Mom still brings it out each year. The vendor laughed and said she had one, too, and that it was probably from a kit. For $18 we couldn’t resist, and the vendor threw in the felt ornaments as a little Christmas gift. Ho ho ho! We saw a Shiny Brite wreath from two rows away. 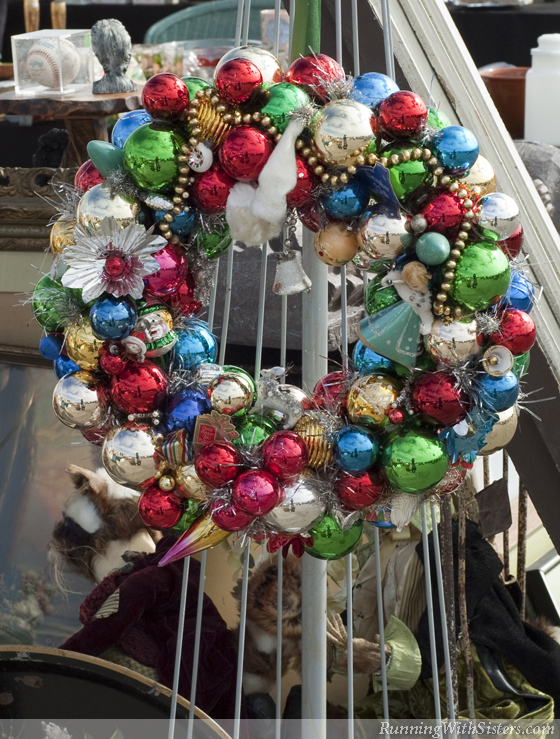 What a festive way to greet carolers at your door! The same dealer had crates of Christmas records and boxes of twinkle lights and bulbs. But we skipped all that and went straight for a framed jewelry tree. What a beauty! 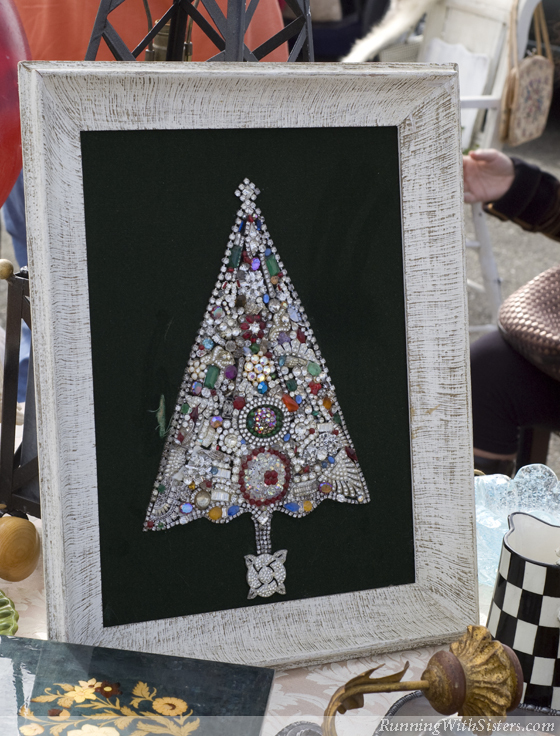 The Christmas tree was made of rhinestone brooches, earrings, and shoe buckles. We see these for sale every year, but this one was especially well done. Kitty got that glitzy tannenbaum for $25. 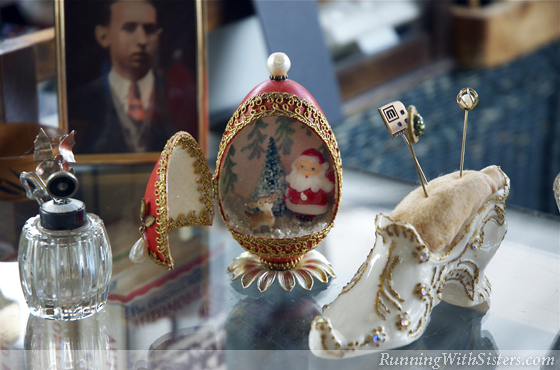 A gal we like to visit had all kinds of handmade ornaments. She showed us a collection of calico bells and hearts that must have been a magazine project in the 70s because we made ones just like them when we were kids. Mom did the sewing, and we all stuffed the shapes. 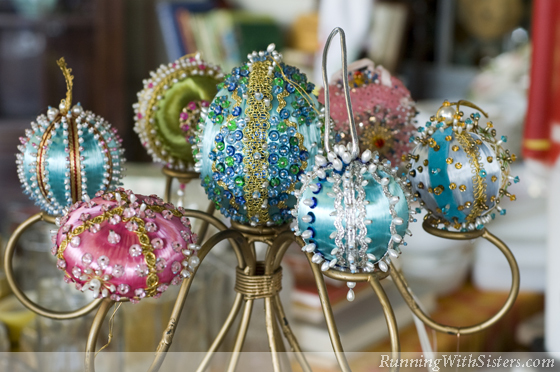 The eye-catcher of her booth, though, was a candelabra displaying satin balls covered with pearl-tipped pins and sequins. We had lots of these on the tree growing up, but never knew who made them. They were so pretty we decided this would be our girls’ night craft for December. 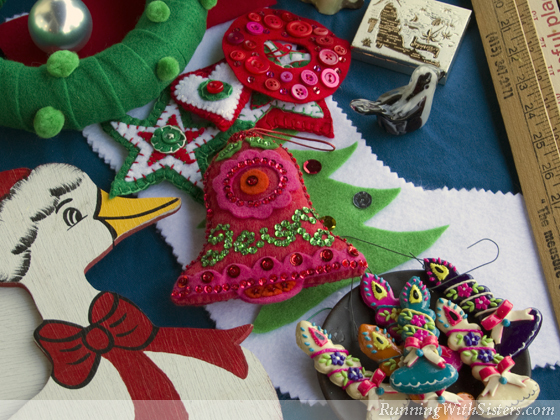 ’Tis the season to be crafty! I would like ideals on remaking old furniture . I’m making window,s decorating like draperies.taking old tires and making something from them. dmaking something from pallets crafts.